Can you believe we’re already into the holiday season? As plans evolve for family visits, workplace parties, and gift-giving exchanges, you may be feeling that stress. We all know that stress tends to go up this time of year, and we know that we should be doing things to relax. Common recommendations are to get enough sleep, participate in stress-relieving activities like yoga and long walks, and say “no” when needed. If you’re struggling to fit these activities into your daily schedule, don’t fret. There’s another way you can ease the stress in your life that takes little time but can be super effective. All you have to do is change your mindset. You may see your skin care routine as something you need to do or should do for the health and appearance of your skin, but what if you could make it into something even more beneficial? It could be that your skin care routine already helps you relieve stress, without you even thinking about it. 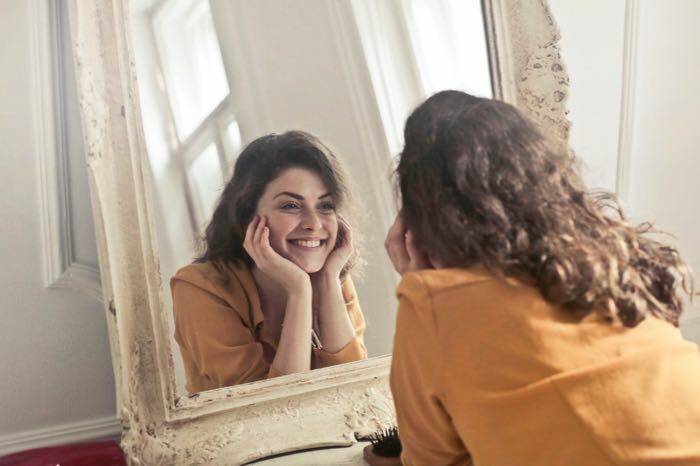 Marie Jihn, dermatologist at Premier Dermatology in San Carlos, California, told the Huffington Post that when you have a set skin-care routine, it can be a relief, because you know what to expect, and you know that doing it’s good for you. We all know that high levels of stress are terrible for skin. Even 10 minutes of mediation helps to improve overall well-being and ultimately the way one’s skin and even hair, looks and behaves. You can easily make your skin care routine intentional and meditative by slowing down and taking just a little more time. Think about what actually happens when you care for your skin. You usually take a break from the rest of your life and go into your bathroom or somewhere else where you feel comfortable. For a few precious minutes, you get to pay attention to something that involves only you, and doesn’t require you to do anything for anyone else. On top of that, it usually feels good to cleanse your face and put on some moisturizer—your skin may tingle or glow afterwards. This is a great start for any stress-relieving activity. All you have to do to make it even more effective is to step up the stress-relieving elements of it. In the old days, we washed our faces and put on our moisturizers and makeup to make ourselves look better. Now it’s about so much more than that. Today, we use a beauty routine to care for ourselves, to care for our skin and hair and nails, and to feel better about ourselves both physically and mentally. When we deep condition the hair, exfoliate the skin, or enjoy a rejuvenating mask, it’s not about vanity—it’s about living a lifestyle that reflects our commitment to wellness, overall, and our desire to be at our best for as long as we can be. The problem is that most of us still rush through our routines, our thoughts on what we need to do next. Slowing down to really enjoy the process may seem self-indulgent or impossible during the extra stressful holiday season, and you may feel guilty at first, but remember you can’t be at your best if you’re not setting aside a few moments everyday for self-care. If you take your time and enjoy the motions of applying your moisturizer, for example, or if you use a hydrating mask for 10-3o minutes, you can even get a sort of meditative benefit from it—a space of self-care that can be restorative. Each step of a beauty routine can work like that for you. We all know that when we feel good, when we’re happy with how we look, and when we feel confident, we are much better able to do our jobs and to help the people around us. It comes full circle. So the first thing you need to do is to simply give yourself permission to spend time on your skin care routine. Shut the door and allow yourself to relax for 10-15 minutes. Certainly you can spare that much time, and you may find that the benefits are well worth it. Once you’ve committed to giving yourself just a bit more time, try these tips for making that time even more restorative. You don’t have to wait until you’re breaking out or getting too dry to enjoy a mask. At least once a week, give yourself 15-20 minutes to apply either a clarifying clay mask or a hydrating mask, then sit back and let it work. Stay in an area where you won’t be disturbed, and consider enjoying a nice glass of flavored ice water or cup of tea while you wait. Music has been shown in studies to help people relieve stress, so take advantage of that and put on some tunes while you’re cleansing and moisturizing. Just make sure the music is relaxing and soothing. Here at CV Skinlabs, we advocate for fragrance-free products because most fragrance is made of potentially harmful chemicals. You can still indulge your sense of smell, by either adding a few drops of your favorite essential oil to your mask or moisturizer, or by diffusing that oil while you perform your skin care routine. (Sensitive skin types may want to test the oil first, as some can be irritating, including mint, citrus, and Eucalyptus.) Aromatherapy is a proven stress-reliever, so get your nose involved! While you’re enjoying an emotional time of relaxation, you want your skin to relax and be nourished, and that can be more difficult if you’re using products that contain harsh chemicals and potentially toxic preservatives. Keep your skin-care space as healthy as possible by including only safe products within it. Today’s products should contribute, not detract, from your overall wellness. Of course, you can always feel good about using CV Skinlabs products, as ours are 100% free of any ingredients tied to irritation or health issues. As the holiday season gets closer, you may be tempted to skip steps in your skin care routine. That’s not only going to rob you of that routine’s stress-relieving benefits, it may also actually increase your stress, as you’ll know that you’re shortchanging yourself. Instead, remind yourself that you can always afford 10-15 minutes for self care, and be sure to go through all the steps you need, including cleansing, toning, applying anti-aging serums, masking, exfoliating, and moisturizing as needed. You’ll feel better that way, and your skin will look better, too. Does your skin care routine help you relieve stress?